This web page has been created for patients who are interested in becoming participants in the Envoy Esteem™ Clinical Research Trial. Which Investigational Sites are Participating in the Clinical Trial? How Do I Become a Participant in the Envoy Esteem™ Research Study? What is the Envoy Esteem™ Totally Implantable Hearing Device? How Many People Have Had the Esteem™ Device Implanted in the United States? What is the Surgical Procedure Used to Implant the Esteem™ Device? The Esteem™ Totally Implantable Middle Ear Device (TIMED) is an investigational device. It has not been approved by the United States Food & Drug Administration. This is the reason that the Esteem™ Clinical Trial is being conducted. The Esteem™ System was approved in Europe, July 2006, and was granted a CE mark. Esteem™ implants are being performed in Europe on a regular basis. The Esteem™ Clinical Research Trial for 2008 (Protocol 0204, Revised May 7, 2009) has been approved by the US Food & Drug Administration and the Moses Cone Health System Institutional Review Board. Welcome to our Envoy Clinical Trial page. You will find important information concerning the 2008-09 Envoy Esteem™ Clinical Trial as well as information concerning our Esteem™ Implant team. The Envoy Esteem™ Clinical Trial protocol and informed consents were approved by the Moses Cone Health System Institutional Review Board on October 9, 2007 and renewed by Full Board Review annually. If you would like to become a voluntary participant in the Envoy Esteem™ Clinical Trial, please read the information carefully. Participants are required to meet all inclusion criteria. If you do not find answers to your questions here, please fell free to contact our audiologists, Amy Daughton, at email address amdaughton@earcentergreensboro.com or Stephanie Nance at snance@earcentergreensboro.com. You may call us at (336) 273-9932 during regular business hours (9-5pm Eastern Standard Time). It is the policy of the Ear Center of Greensboro, P.A. that patients read, sign, and send us a copy of our Email Policy to permit us to communicate via email. Click here to review and print out a copy of our email policy. After reading and signing the policy, please send it to us via snail mail, fax, or email, to: amdaughton@earcentergreensboro.com or snance@earcentergreensboro.com. A Clinical Trial is a type of clinical research study. Participants are enrolled in clinical trials in order to study new medical treatments, medications, or devices. The Esteem™ device is an investigational totally implantable device that is being studied to determine its safety and efficacy for the treatment of mild to severe sensorineural hearing loss. Voluntary Participation: If you are considering enrolling as a participant in the Envoy Esteem™ Clinical Trial, it is important that you understand the nature of the research and understand the general principles that apply to all who take part in a research study. Taking part in the study is entirely voluntary. Personal benefit may or may not result from taking part in the study, but knowledge may be gained that will benefit others. You may refuse to take part or withdraw from the study at any time. If you decide to take part in the research study, you will be asked to sign a Screening & Baseline Subject Informed Consent Form and a Surgical Subject Informed Consent Form acknowledging your understanding of the research being performed and giving your permission to participate. The nature of the study, as well as the risks and other important information about the study are described in detail in the informed consent documents. Questions: Take time to ask the study doctor or study staff as many questions about the study as you would like. If there are any words or information that you do not understand, the study doctor or study staff will explain them to you. Reading the information contained on this web site and talking to the study doctor and study staff may help you to decide whether to take part or not. The study is being sponsored by Envoy Medical Corporation, St. Paul, MN. For more information concerning the Sponsor, you may visit their web site at www.envoymedical.com. Complete the Medical History Questionnaire -Click here to download a copy of the Medical History Questionnaire in .pdf file format. **Click here for a copy of the Medical History Questionnaire in MS Word format. **You may use your word processor to complete this version of the form. Undergo and pass necessary diagnostic tests (a CT scan of your ears for surgical considerations and a pregnancy test, if indicated). The CT scan will be performed here in Greensboro as specializedCT scan views and techniques are needed. Our CT scans are performed by Southeastern Radiology,Greensboro, NC. Be selected for the study by our implant team and the sponsor based on the above. The Esteem™ Totally Implantable Hearing Device (TIMED) is a totally implantable hearing system that is implanted under the skin behind the ear and in the middle ear space. The Esteem™'s purpose is to help improve hearing in adult patients who have mild to severe sensorineural hearing loss, and who have at least 60% or better discrimination of words (WRS). The goal is to provide comfortable, natural sounding, high fidelity sound to participants with sensorineural hearing loss by direct driving of inner ear fluid. 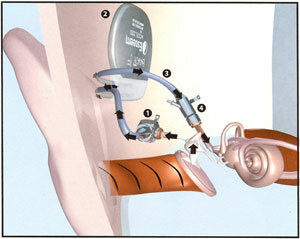 An Envoy Esteem™ Totally Implantable Middle Ear Device (TIMED) is shown implanted under the skin of the right ear. The Esteem™ device consists of: (1) a Sensor-PZT transducer that serves as a microphone, (2) an implantable Esteem™ Sound Processor containing a non-rechargeable battery, (3) connecting IS1-like leads that detach from the Sound Processor, and (4) a Driver-PZT transducer that vibrates the stapes. There is no external hardware, and the ear canal is not occluded. Control and programming of the Esteem™ are achieved through transcutaneous telemetry. Black arrows indicate the pathway that sensed sound energy travels through the Esteem™ system. The second (incus) and third (stapes) hearing bones are separated to prevent feedback vibrations. The totally implanted Esteem™ Device is composed of two piezoelectric bimorph crystals connected to a Sound Processor (contains electronics and battery source). One piezoelectric crystal, the Sensor, is interfaced to the second hearing bone (the incus). The Sensor serves, in conjunction with the patient's native eardrum (tympanic membrane), as a “semi-biologic” microphone. The eardrum serves as the "diaphragm" of the microphone. The second piezoelectric crystal, the Driver, is coupled, through a facial recess tympanomastoidectomy surgical approach (a standard ear surgery procedure), to the third hearing bone (the stapes). During the surgical procedure, the incus is separated from the stapes to prevent feedback vibrations. Sound signals enter the ear canal and vibrate the eardrum and incus. The vibrations are then “sensed” from the incus by the Sensor . The sound signal is then “relayed” to the implanted Sound Processor to be amplified and processed. The processed signal is “relayed” to the Driver that is coupled to the third hearing bone, the stapes. The stapes vibrates fluid within the inner ear (the cochlea). The fluid vibrations cause tiny hair cells within the cochlear to send neural signals to the brain that result in the sense of hearing. Because the Esteem™ is totally implantable, the participant does not wear any external hardware. The Esteem™ is totally invisible. Nothing is worn in the ear canal or behind the ear. Bathing and swimming are possible without removing any external components. Participants may leave their Esteem™ device turned on 24/7 just like their natural ear. No more fumbling around in the dark at night to find your hearing aid. No more embarrassing situations when your hearing aid batteries suddenly die. No more ear canal infections from hearing aid molds. No more occlusion effect from a hearing aid blocking your ear canal. No more broken battery doors, cracked tubing, and ear wax blocking the microphone. No more lost hearing aids when you jump into the water without removing your aids or inadvertently send the hearing aid to the dry cleaners in your shirt pocket. No more hearing aid batteries...period. A small remote control device that looks like an iPod, the Personal Programmer", is used by the patient to control the Esteem™ for volume, distance, etc. The Personal Programmer uses standard batteries and has USB capability. Computer Programmability: In addition to the participant's ability to control their Esteem™, the implanted Sound Processor is totally computer programmable by our audiologists using special Commander Software. Energy for the implanted Esteem™ Sound Processor is provided by a non-rechargeable battery that is hermetically sealed within the Sound Processor. Participants never have to change batteries or charge batteries. Battery life of the Esteem™ sound processor is approximately 4.5 - 8 years depending on individual power requirements. Two months before the internal battery becomes depleted, the participant will hear a tone to signal that a sound processor/battery change is necessary. When the battery is depleted, the combined Sound Processor/Battery is explanted and a new unit is implanted. Sound Processor battery replacement is an outpatient procedure. The procedure is performed in an ambulatory sugery center under local anesthesia with sedation, usually in the morning. It is similar to having a depleted cardiac pacemaker battery replaced. The procedure takes approximately 45 minutes and is performed through the same behind-the-ear incision (although more limited) that was used for the initial implant. Only the Sound Processor/Battery is replaced. Original transducers and leads are left in place. When an battery replacement is performed, the participant automatically receives an updated, state-of-the-art Sound Processor along with a fully charged battery, as permitted by regulation. New Sound Processor/Battery technology is backward compatible. Reprogramming of the Sound Processor and Personal Programmer are performed at The Ear Center, usually in the afternoon, on the same day that the battery is replaced. Sutures are removed seven to ten days after the procedure. After being implanted with an Esteem™ device, participants may not undergo magnetic resonance imaging (MRI scanning involving exposure to strong magnetic fields). CT scanning (involving conventional x-ray irradiation) is permitted. How Many People Have Had an Esteem™ Device Implanted in the United States? The first generation Esteem™ Clinical Trial was performed from 2004-2006. A total of seventy-two (72) participants were implanted. The first part of the Esteem™ Clinical Trial was closed to accrual in October, 2006. The second generation Esteem™ Clinical Trial began in 2008. A total of fifty-seven (57) participants have been implanted. Greensboro, NC: Of the 72 first generation implants in the USA, 20 patients were implanted in Greensboro. Of the 57 second generation implants, 22 patients were implanted in Greensboro. Approximately 50 European patients have had the Esteem™ device implanted. What Surgical Procedure is used to Implant the Esteem™ Device? Our experienced operating room team has been specifically trained in implantable device techniques during the past five years. If you have any questions concerning our Esteem OR team, please contact Julie Christopher, R.N. at (336) 272-0012. Participants are observed for 23 hours overnight and are discharged the next morning. One loved one may stay with you overnight at the Surgical Center. Click here to download a copy of the SCA Surgical Center of Greensboro Outpatient Information Brochure. It includes a map and relative location to the Ear Center. Please print out both forms, complete, and take with you to the Surgical Center the morning of your operation. You will find information and downloads that will assist you in determining whether you would like to participate in the study*. forms, complete and take with you to the surgical center. map and relative location to the Ear Center of Greensboro. If you would like to learn more about the investigational Esteem™ Clinical Trial, please contact our office at (336) 273-9932 and ask for our Audiology Department. To learn more about our implant team and our office, please visit the rest of our web site.